The RSFirewall! System Check does a complete WordPress file system scan. The scanner checks if each WordPress file is intact. To trigger this functionality, head to RSFirewall! > System Check and perform the System Check. RSFirewall! will notify you if any of your installation's files have been modified. You have modified the files yourself: If this is the case, you can set up the component to ignore these files by selecting them and clicking on Accept changes for the selected files. You have uploaded the files using the ASCII transfer type: If you find yourself in this situation, please refer to the RSFirewall! 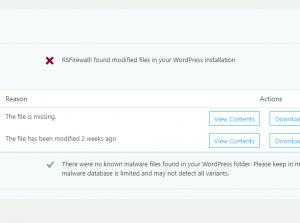 alerts that many Wordpress files have been modified article in RSFirewall! 's documentation section. You haven't modified the files yourself: If the component notifies you that some files have been modified, and you have not performed this action yourself, your website was, most likely, hacked.